We are very pleased to announce that “Business Excellence? – Introduction and Guide” is now available for download from the Apple iBookstore, at a limited time “free” price…. Hi Just added a little video which posses a question and then gives a answer. 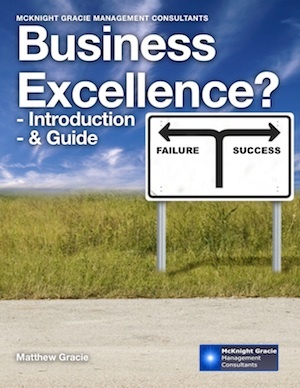 We are patiently waiting for Apple to approve the Business Excellence Introduction & Guide interactive ebook. It is taking a little longer than we expected, as we have setup a special price of £0.00 for the launch, maybe if we had set a higher price it would have gone through quicker?. Remember that you can download a pdf of the text and still get the interactive version when it comes out. You are currently browsing the The McKnight Gracie Blog blog archives for March, 2013.